Pembrokeshire is perhaps Wales’ ultimate family camping holiday destination. Whether it’s the beaches, the wildlife or the historic towns and ancient fishing harbours, Pembrokeshire has plenty to offer to those who come by car, train or rickety old campervan. Long walks along the Pembrokeshire Coast Path and exhilarating afternoons jumping off cliffs into Abereiddy’s famous blue lagoon are just a couple of off-the-cuff reasons for descending on this coastal county. Add in great dining options, interesting independent galleries to visit, and, of course, a heap of truly excellent campsites, and it is no wonder Pembrokeshire attracts over 4 million people each year. If you’re looking for an unforgettable stay with the family then you can’t go far wrong here. And, to help you make the most of holidaying with your littl'uns, we’ve whittled down our favourite family things to do into a handy list of just ten. Check out our favourite family attractions in Pembrokeshire below and let us know on social media if you think there are any hidden gems that we forgot! One for history aficionados, Pembroke Castle, built in 1093, was the birthplace of Henry VII, and the site of some of West Wales’ greatest battles. Today, things are a little calmer but visitors can take in living history days and enjoy a number of exhibits inside that give visitors a complete history of the life of the fortress. Located in the Welsh harbour town of Tenby, the two-mile-long Tenby Mystery Treasure Trail is a unique murder mystery walking tour that takes you from the boats of the waterside all the way through town. Allowing you to explore the town at your own pace, as well as adding some added fun for the kids, the aim is to solve the dastardly crime that has been committed. Visitors will see some of Tenby's best sites including the Five Arches Gate, seafront and Castle Hill, while little ones will pick up some of the history of the area without even realizing it! Situated in northern Pembrokeshire is Castell Henllys. The entire area is a fantastic pre-historic site. The rugged Welsh landscape is on show to the full here but there is more than meets the eye when visiting. The area is an important archaeological zone, and many archaeologists in training work at Castell Henllys during the year. The site is home to an Iron Age hillfort and, today, replicas of the original round houses and a granary have been built for visitors to explore, learning about the areas Celtic heritage. Families will love a day out at Folly Farm. The adventure park and zoo is home to over 700 different animals, though the resident farm animals are often amongst the favorites. Children can get up close with pigs, cows and sheep, with a more considered distance being given to the penguins, lions and rhinos that are there too! There is also an area with games and a playground for the kids to stretch their legs. Manor House Wildlife Park is filled with exotic animals. As the park says, it is quite a zoonique experience, and one animal lover’s won't soon forget. Families can stroll through the park and get up close to a variety of animals, including kangaroos and lemurs. Kids can also enjoy jumping around in the hay play area or get some exercise on the digiwall. History comes alive at Carew Castle. The castle was the centre of Norman rule during the 11th century, and culture vultures will enjoy learning all about the historical fortress. Carew Castle hosts a number of events during the year – visitors can learn archery, take a ghost tour or experience an open-air theatre performance. Near the castle you’ll also find Carew Tidal Mill, the only tidal mill in Wales to be fully renovated and restored to its original style. Home to 25 owl species, The Secret Owl Garden allows families to learn more about this unique bird. 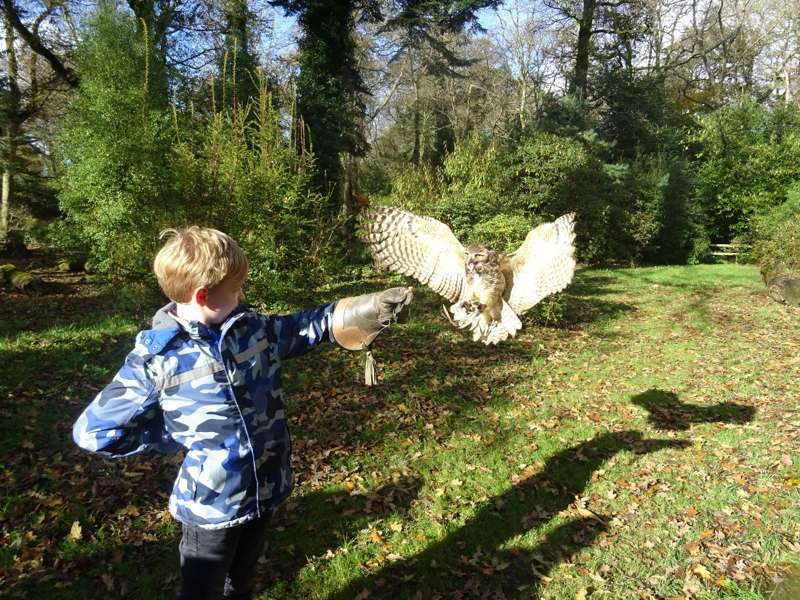 Kids can watch owls fly around the grounds and they can even take part in flying an owl themselves in the private experience. Visitors also get entry into Picton Castle with their admission ticket to The Secret Owl Garden, so you can really make an entire day of the two great Pembrokeshire attractions. Rides, activities, games and dinosaurs are all waiting for families at The Dinosaur Park Tenby. The entire family can traverse the dinosaur trail spotting prehistoric creatures along the way. After that, the park's less dinosaur-related attractions are also on offer –there’s a go-kart track, indoor playground, trampoline park and crazy golf, among others. Scolton Manor is an all-weather attraction that will keep the family busy come rain or shine. This 60-acre park and woodland attraction is perfect for families looking to roam around. Three-storey Scolton Manor gives visitors a glimpse into life during the Victorian era, while the Pembrokeshire Beekeeping Centre, also on the site, offers insight into the world of honey making. There is also a fantastic tearoom. Raggedly wild and beautiful, the UK's smallest city promises scenery and activities in spades. Named after the patron saint of Wales, St Davids is little more than a village, yet is packed with enough to make it (almost) worthy of its city status. The 12th century cathedral is a beauty – its aged purple and gold local stone looks magnificent at sunset, and features include a 125-foot square tower with clocks on only three sides, a magnificent 16th-century latticed oak roof and the monarch’s stall – while the atmospheric ruins of the Bishops’ Palace lie opposite, and date back to the 14th century. Spend a day touring the two and enjoying the dainty shops of the city before heading out to make the most of the surrounding coast.